I’ve just returned from the 13th Annual International Guild of Realism Exhibition which is being held in Santa Fe, New Mexico this month. 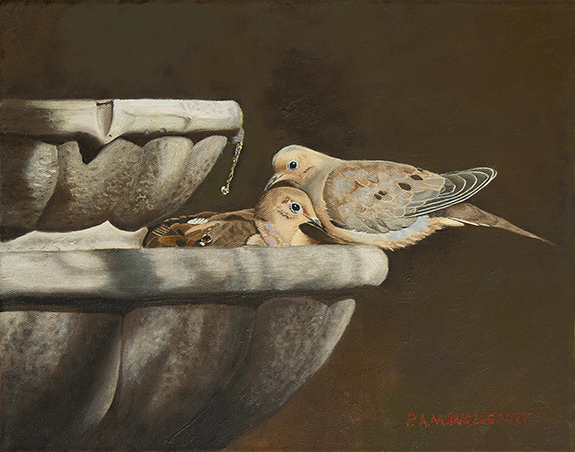 It was a real treat to have one of my paintings—Two Doves in the Fountain—juried into the show, and even more exciting was the fact that my painting sold even before the official exhibit opened. Needless to say, I was thrilled to receive the news of the sale from Michael Sugarman, owner of the gallery which hosted the show. The Guild is a group of hundreds of national and international artists who specialize in realism in their approach to art. Each year the Guild evaluates hundreds of submissions for their yearly exhibit. It uses a two-tiered jurying process with about 50% of the original submissions surviving the first cut. A final cut in the jurying process then selected only 92 artists to be shown in the Santa Fe exhibit. 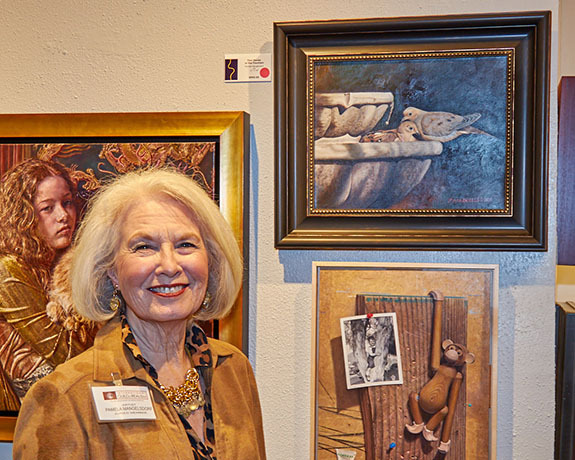 The Guild’s 13th Annual Juried Exhibition will be on display until October 29th, 2018 at the Sugarman-Peterson Gallery in the heart of the world-famous Santa Fe Art District. If you have the opportunity, please visit the exhibition during October. It’s a beautiful time of year to visit Santa Fe and enjoy some of the finest realism artwork available anywhere. You are amazing and I’m very proud to be your friend. CONGRATULATIONS Pam !!! Your work is magnificent. Pam, what great news that your painting sold so quickly. I would think that the Gallery would welcome more of your work. It must have been a wonderful time being there. Looking forward to hear all about your celebration. Incredible work! So real, I thought that it was a photograph! & Congratulations on the sale. Congratulations Pam, Your work is so amazing to me.